I'd like to thank the people who followed agent Mark McVeigh's blog so I could win a Skype chat with him. Virtual hugs to all of you--that was really kind. 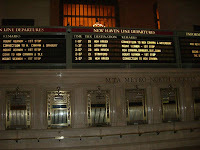 I spoke with Mr. McVeigh last week and asked him my list of questions. He was super knowledgeable and helpful. I'd heard him speak in Seattle in 2006 and NYC in 2007--back in his editor days--and he'd impressed me; it was really cool to actually have a conversation and be allowed to pick his brain. So again, thank you. And a bonus for all of us who are following? His blog is informative and very much worth reading. Just today, he posted good news about Houghton Mifflin Harcourt. 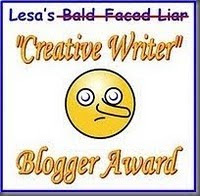 Now on to some fun awards from bloggy friends! Niki at Wool'n'Nuts gifted me with the Kreativ Blogger Award. The rules say I'm supposed to tell you seven things about myself. However, since she technically awarded it to Chester (the squirrel I've been feeding all winter), too, I feel I should start out telling you about him. 1. One of Chester's favorite foods is birdseed. 2. Chester's activity of choice is tormenting my dogs. 3. I ran before I walked. 4. I saw myself as a writer by the time I was nine. 5. I think high school geometry is a frightening class, and I'm thankful I survived it. 6. My dad interviewed the first boy who asked me out (and I'm thankful I survived that, too). 7. My son says I should mention that I get sympathy pains when he or his sister gets hurt. However, I will neither confirm nor deny these allegations. Thank you, Deb! Deb, by the way, is a crack up and an all around nice person, so definitely go to her blog if you haven't yet discovered her! The award rules say I'm supposed to tell up to six outrageous lies about myself and at least one outrageous truth. I have to say I had a fun time coming up with lies, but I'm hoping you all still trust me after I tell a few stretchers. I'll give a hint by telling you five things on my list are lies and two are truths. Ready? 1. Just after making the cut for the 1984 U.S. Olympic team (equestrian), I fell off my horse and dislocated my shoulder. I was dropped from the team. Since the Olympics took place in L.A. that year and I lived in L.A. County, I was able to go and cheer on my friends. 2. My mom and a few friends met JFK. Even though he only talked to them for a few minutes, a photo of them together came out in a magazine about twenty years later. 3. When I was four, I modeled shoes for the Sears catalog. I did this for two months, but I got fired when I started throwing tantrums. 4. I performed in three parades at Disneyland. 5. My cousin Paul played a corpse on NCIS in 2008. 6. I have a bobblehead collection. Some of my favorites: Rodney Dangerfield (CADDYSHACK edition), the Kraft Macaroni and Cheese dinosaur, and thin Elvis. 7. They had to stop the escalator at Mall of America because my shoelace got caught. I'll let you guess, and I'll reveal my truths in my next post. I'm just mysterious that way. It will be fun to see what they write! 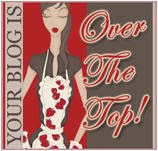 The final blog award is the Over the Top Award. Niki at Wool'n'Nuts gave it to me. Thank you, Niki! I told you she was a sweetheart. She really is--check out her blog if you haven't done it yet. I'll wait here. b. I've talked so much about myself in this post, I'm going to give you all a break and skip that part. Yesterday I finished reading a friend's full. It's a gorgeous novel, beautiful and poignant. You know those moments when you stop to look at what you're doing, and you like what you see? It's huge, really, to be a critique partner or a beta. And those moments, like the one I had yesterday when I finished reading a manuscript that feels like a book and deserves to be a book...they're so special. Reading an excellent pre-book is like getting to know the star of a big movie before it's released, before the trailer is even in theaters. But you're in on it, and you know what's going on. It inspires me to know my friend, someone like me, created that manuscript. I'm touched she trusted me with it and asked for my thoughts. I'm excited to be a writer. I'm happy this is what I do. Just so you know, my friend Debra and I had way too much fun with this. By the time I have my second blog contest, I may be less geeky and may not feel compelled to share every little thing with you. But don't count on it. My geekiness runs deep. Debra acted as quality control for the "My-Followers-Rock-so-Someone's-Winning-an-Autographed-Copy-of-a-Book-that-Won-the-Printz" Contest. 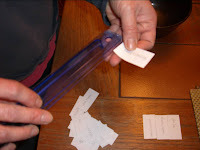 Here's a picture of her making sure all entries had the exact same surface area and, therefore, odds. Debra mixed the names like an expert. I asked her to lift the bowl above her son's head so he could draw one name. Congratulations, Molly! And look how excited Debra is for you! Please email me with your mailing address ASAP so I can get your autographed copy of GOING BOVINE in the mail for you! 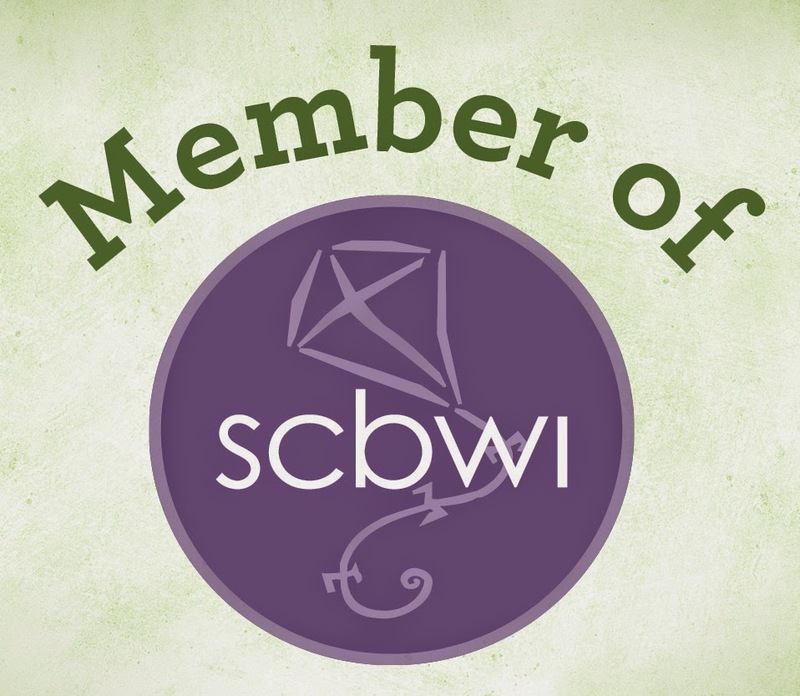 Even though I still haven't done the second post about the SCBWI Winter Conference, it's time for my first ever blog contest! Squee! I'm really excited about this! To celebrate having 100 followers, I am giving away an autographed copy of Libba Bray's GOING BOVINE! Isn't that cool?! Here's a picture of me with Libba Bray last weekend, seconds after getting the book signed. Okay, she doesn't actually know me at all, but I bet she'd like me--at least a little--if she did. Don't ya think? 1. Followers who comment on this post before the close of the contest are automatically entered. 2. You must be a follower to enter, and each follower can enter only once. 4. The contest closes on Wednesday, February 10th, at 6:00 pm PST. I'll jump into the comments at approximately that time to officially shut things down. Wow! I really doubt anyone would dare say, "That's been done." I've been working on my synopsis (again) this weekend, and the GOING BOVINE flap copy just gave me some serious synopsis envy. 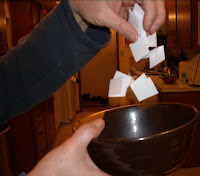 My friend Debra got all excited about my contest and wanted to help. She volunteered to step in as quality control. This cracked us up, of course, because I am rather law-abiding, but nothing is too good for you people. I wonder if I should get Debra a whistle so she can officially officiate the My-Followers-Rock-so-Someone's-Winning-an-Autographed-Copy-of-a-Book-that-Won-the-Printz Contest. Whistles equal power, after all. But will all that power go to Debra's head? Hmm...so much to think about. Have I mentioned how much I love New York? Only like a bajillion times, right? Yet it's totally worth repeating. Every cell in my body gets extra bouncy and cheery when I'm there. I also love SCBWI conferences. 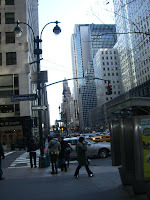 Put them together, New York and the SCBWI Winter Conference...weeee! Friday's Writers' Intensive was one of my favorite parts of the weekend. An editor led my first group and an agent led my second. Both were very helpful. Each writer had an allotted amount of time, and all the table members gave feedback on each person's pages. It was fun and extremely educational. 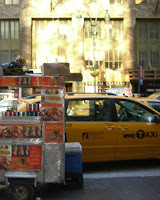 Moving on to Friday night...I've been to Kidlit Drink Nights, but I went to my first NYC Kidlit Drink Night on Friday! It was a blast! I met lots of new people, and I also ran into some SCBWI-WWA friends there. 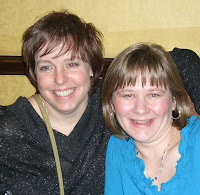 Here's a pic of Joni Sensel and Laurie Thompson, our Co-Regional Advisors. They're awesome! Libba Bray, our first keynote speaker, was hilarious. The title of her talk was Writing as an Extreme Sport, and it was about risk taking in our writing. Those of you who are up on your awards know that Libba Bray recently won the Printz Award for her book GOING BOVINE. Jacqueline Woodson's talk made me cry about three times. I'm a sap, but it wasn't just me--she seemed to touch everyone. Her writing: beautiful, powerful, moving, concise...wow. She writes in verse, and listening to her speak made words bubble up in my brain, begging to be put onto paper. I felt peaceful, clear, and inspired. I plan to pick up one of her books for the times when I need an extra boost. I roomed with Jennifer Mann. 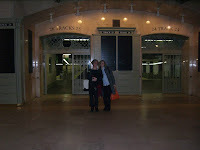 The above picture shows us looking like tourists in Grand Central Station. Maybe because we were tourists in Grand Central Station? We were going to breakfast and I already had my conference name tag on. Poor Jennifer...she can't take me anywhere. Jennifer is a very talented artist and writer. If you want to see some of her lovely art, go to her blog. It's fun there! 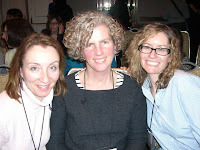 This is a picture of Stasia Kehoe, Jennifer, and I at the conference. Stasia and I have agreed to be beta readers for each other in the future. 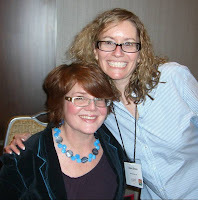 I met Stasia at my very first SCBWI conference in Seattle! I got to peek at her manuscript's opening while we were in New York and it's great! Some exciting news: I'm going to have my first ever blog contest after I get 100 followers! Hooray! I really do appreciate my followers--you guys are wonderful and you make the blogging adventure a fun one! Thank you!